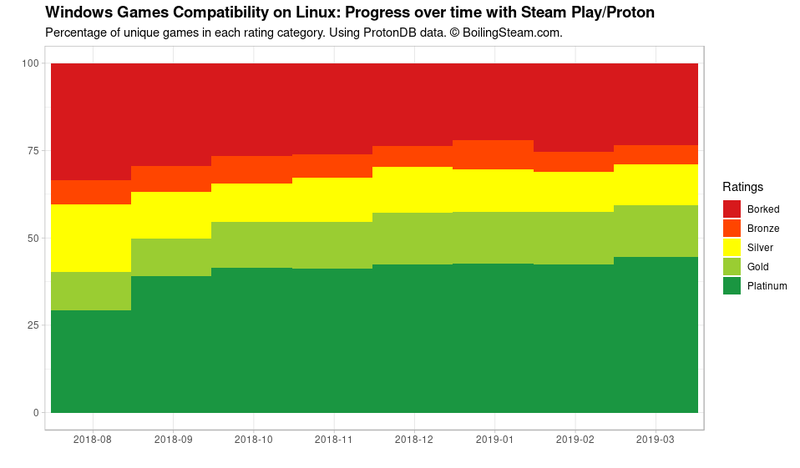 Don’t we all feel that the world of Linux gaming is in a better spot right now than let’s say, 7-8 months ago? Thanks to Valve, Codeweavers, DXVK and all the gang we can now enjoy a lot more games coming from the Windows world than ever before. I decided to take some time to show what kind of progress we are talking about. Yes, using ProtonDB data again. One game with multiple ratings is only counted once. When multiple ratings are available in the same month, the median of the ratings is taken. (let’s say, there are 5 Platinum ratings and one “borked” evaluation, the median will be “Platinum” anyway). In some situations the median is not a real value (i.e. it ends up in between one rating and the next) – in such situations I take the conservative approach to fall to the lower rating rather than the better one. I had a graph on a weekly basis as well but there are not enough submissions per week to make it reliable so I took a monthly frequency instead. September 2018 was the biggest jump in compatibility by far, followed by less spectacular but steady improvements until December 2018. January and February 2019 were rather calm, there was only a new Proton release in mid-feb 2019 and it did not move the needle too much. March 2019 is special. There was only a new release of Proton (4.2) at the very end of March (26th) yet it was sufficient to bring enough new reports and change the overall picture. I therefore expect the overall compatibility situation to look even better in April 2019, once more games go thru a 4.2 testing phase.